The Merlo Turbofarmer series was born of the 1994 P27.7 EV, designed specifically for UK farmers. Compact Turbofarmers are only 2m wide, with low-profile builds below 2m high. Eight models have lift heights of 6m or 8.2m. 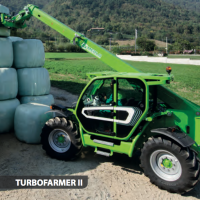 The 16 TurboFarmer 2006 models have a Deutz turbo engine of either 102 or 140HP. Either fixed axles or Merlo's unique integral sideshift and frame levelling axle are used. Many feature ‘Load-sensing’ hydraulic systems for greater efficiency and speed. The UK TurboFarmer build includes a host of farmer-specific features - front & rear axle differential locks, rear service line, radio etc.